The training and examination program for 1st Kyu grade in the art of Ninjutsu / Budo-Taijutsu is available as a DVD video with a runtime of 54 minutes. 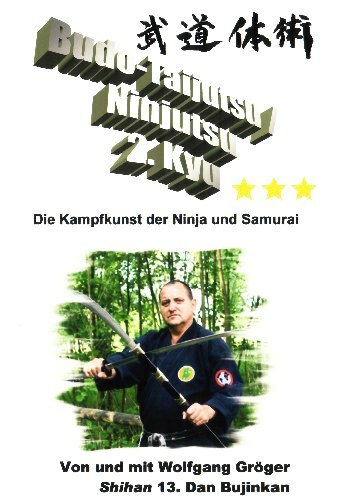 Important basics and also some variations for the 1st Kyu grade, which are necessary to learn this complex combative art, are demonstrated and explained on this video, in order to study these combative arts as traditionally and currently as possible, following the doctrine of grand master Dr. Masaaki Hatsumi (Japan). Content: Proceeding techniques (when trying throwing and levers), counter strikes (when trying throwing and levers), Free defence (one aggressor and two aggressors with and without contact, also with stick, knife, chain, chair, etc. 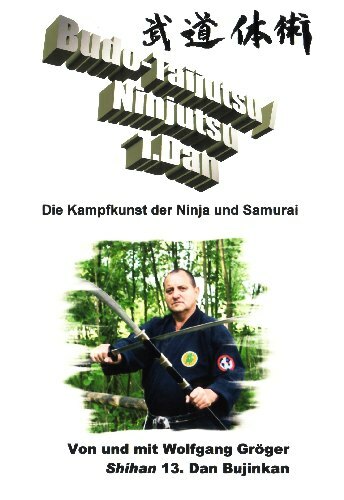 ), defnce against sword – Mutodori (without weapon), with sword, with Hanbo, with Jutte and Bo), Randori (high level, for example dodging by rolling and Tai Sabaki, striking back and defending, holding, tactics, etc. ), defence on the floor (with and without contact), Ju Tai Jutsu IV (Shikaashi, Jigoku Otoshi), Torite Kihon Gata V (Omote Oni Kudaki, Ura Oni Kudaki, Temakura), Shime Waza Kihon Gata (Hon Jime, Gyaku Jime, San Kaku Jime, Eri Jime), Shime Hodoki (Shime Hodoki Temakura, San Kaku Jime Hoshi Dori Nage, San Kaku Jime Zu Dori Nage), Kyusho (Atemi / Schmerzpunkte gesamter Körper), Ju Tai Jutsu V (leg bowing lever, arm bolt from outside, arm bolt from inside, pulling leg through, punching and ripping the body back), Kiai Jutsu (kinds of Kiai and their execution).